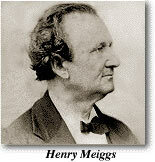 Henry Meiggs was one of the biggest "hustlers" in San Francisco during the early '50's, a pioneer promoter of his day. He didn't overlook anything, and like most men of his day and generation he made his word good. He was forever pushing some enterprise. When he landed in the city in 1850 all the vessels entering the Golden Gate anchored in Yerba Buena cove at the foot of what was then Washington, Commerical and Jackson streets. Wharves were extended into the bay water there, and residents generally recognized that locality as the city's only shipping point. Harry Meiggs had other ideas. A year or two later he boomed North Beach and built a road around the base of Telegraph Hill to Clarke's Point on the north shore, where he had invested a pot of money in real estate. He ran out a wharf 2,000 feet long from the foot of Powell Street, graded and extended the streets in that quarter, and started a real estate boom. His object was to induce ship owners to make use of his facilities for their warehouses. He urged that his dock was closer to the Golden Gate, and its inducements superior to the old anchorage. He plunged heavily into debt trying to swing this big scheme. Meiggs knew every game being played in the city, political, social, financial and otherwise. At that time street work was paid for in warrants on the public treasury, signed by the Mayor and Controller. The Controller had fallen into the easy habit of signing entire books of blank warrants, and the Mayor, being a good fellow, followed suit. Meiggs knew their system and though a pliable subordinate got possession of one of these books properly signed for issue. There was no money in the street fund at the time, but that did not disconcert Meiggs. He knew that the money lenders of the town would bite at them, not knowing the situation, a sharp commentary on the way the city business was conducted. Before any one had an inkling, Meiggs had scattered enough warrants among money lenders to raise his monthly interest to $30,000. Meiggs was safely in flight when the storm broke. How much money he carried to Valparaiso, Chili, was never discovered. Meiggs later declared that he landed with only $8,000. He lost this in speculation, and had to pawn his watch. South America at that period proved a gold mine for a man of Meiggs' irrepressible and resourceful character. Eventually he accumulated a fortune estimated at $100,000 by building railroads in Peru and handling government contracts in adjacent countries. From his earnings he paid back every cent he owed his creditors in California. Eventually he made overtures to return here, but failed.